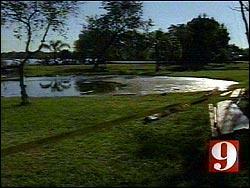 An Orange County couple woke up to a sinkhole in their backyard and it keeps getting bigger. Now the couple has evacuated their home. When Dr. Thomas Fisher and his wife Kathi woke up in the morning, they did not expect to see a sinkhole in their yard. The Fishers were in disbelief when they noticed two 30 foot trees, a shed and two other citrus trees had been swallowed up by the ground. Even though the sinkhole opened up Thursday morning, it started getting bigger throughout the day, leading the county to deem the home unsafe. Engineers estimate it is at least 50 feet wide, but are unsure how deep it is.